According to my tech editor the romance text I first wrote for this pattern needed a “sleek Swedish guy to give it new life.” That got my brain reeling, but not with anything that is printable. Whew. Moving on… I’m a life-long book collector. In addition to piles of books of knitting, fiction, art, counted cross-stitch, needlepoint, gardening, as well as a fair number of other things, I have always been attracted to stitch dictionaries, and little books of patterns on a given theme. 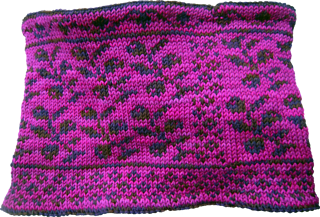 All three motifs in this design came from a slim little volume of Swedish colorwork designs that I’ve had so long that I no longer have a clue where or when I came across it. Once I had these lovely motifs working together, I needed a name for my design. I thought that something Swedish would be appropriate. A dear friend of mine happens to have grown up in Sweden, so I went to her for inspiration. Without my telling her, she thought the main motif looked like berries, and so suggested Vinterbär, which is Swedish for winter berries. Perfect! 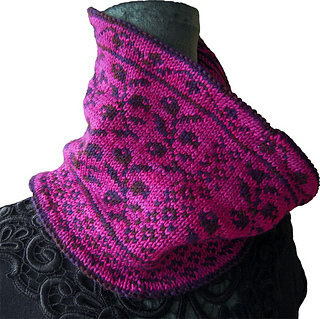 Cowl is worked in the round, features folded hems, and three different colorwork motifs. Yarn: worsted weight; 125 yards MC, and 175 yards CC. Skills: k2tog, two-color knitting in the round, provisional cast on. Notions: 1 stitch marker required, smooth waste yarn of same or slightly finer thickness, in a contrasting color for provisional cast on, yarn needle.